You'll find Crossroads Plaza and Cary Towne Center within 2 miles (3 km) of this hotel. Cary Arts Center and Bond Brothers Beer Company are also within 3 miles (5 km). This hotel features an outdoor pool and a fitness center. Traveling on business? Take advantage of the 24-hour business center and free WiFi in public areas. Guests will appreciate freebies like continental breakfast and free self parking. The 138 guestrooms have LED TVs with cable channels and offer free WiFi and coffee/tea makers. Other amenities include free newspapers, free local calls, and hair dryers. The area, friendly personnel, and cleanest.... I would definitely recommend to my family and friends. Convenient to interstate but signage not easy to see. To begin with the toilet backed up. Then on Tuesday (we had been there since the previous Saturday) I had to go to the desk and ask for my room to be cleaned. Seemed housekeeping was understaffed as I saw a few working as late as 7:30 pm. The ladies in the breakfast room were absolutely amazing! They were very kind and accommodating. Several outer doors would not let us enter with our key cards so we HAD to park in a specific area in which left a whole side parking lot empty because the doops would not open. In town for an early morning medical test. Basically, we just needed a place to sleep. Found it to be convenient, priced well and most importantly, very clean. I would stay there again. Pros: It was small and quiet and easily accessible. Cons: Though the window in the room faced the pool in the center of the hotel and the window was tinted and had sheers over it, the curtains did not close. Location: Lots of shopping and easily accessible to I-40, Raleigh, Durham, Chapel-Hill, and, of course, Cary. This was a small hotel at the intersection of Walnut Street and US 1. It was easily accessible, had lots of shopping within a couple of minutes in both directions, was easily accessible to I-40, quiet, simple, comfortable, and affordable. Was adequate for a quiet night's sleep. Pros: The hotel had 2 types of room; standard and with kitchenettes. It was a great option. Cons: Little things like a lamp without a light bulb. The address needs to be changed to accurately reflect the location. Location: The location was near parks, shopping and restaurants. We asked to have our room switched and were accommodated quickly. The rooms were updated and ours had a very nice kitchenette. Nice hotel close to restaurants & shopping. Pros: It was clean, convenient, the brunch was nice, the personnel were pleasant. Cons: We have no suggestions. Location: It was a convenient location. Numerous restaurants,sports and musical events, and theatres were close by. It was perfect for our needs. We were checked in quickly. It was very helpful to have made the reservation through Travelocity in advance. It expedited the process and the room rate was less expensive. We were pleased with our first Travelocity experience. We hope to use the service again in the future. Close to Cary Towne Center. Nothing really special. Tons of construction going on. Hard to find as its deep down off the road. Good thing both me and my fiancé are from the area so we found it with ease. But for out of town travelers not so easy. 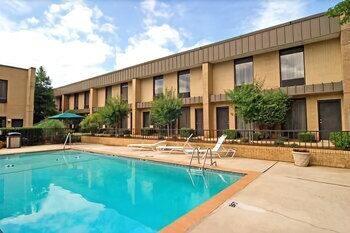 Best Western Plus Cary Inn - NC State offers its guests an outdoor pool and a fitness center. WiFi is free in public spaces. A 24-hour business center and a meeting room are available. Free breakfast is available. The business-friendly Best Western Plus Cary Inn - NC State also features complimentary newspapers in the lobby, laundry facilities, and dry cleaning/laundry services. Free self parking is available. This Cary hotel is smoke free. Best Western Plus Cary Inn - NC State offers 138 air-conditioned accommodations with complimentary newspapers and coffee/tea makers. LED televisions come with cable channels. Bathrooms include shower/tub combinations, complimentary toiletries, and hair dryers. This Cary hotel provides complimentary wireless Internet access. Business-friendly amenities include desks and phones; free local calls are provided (restrictions may apply). Microwaves and refrigerators can be requested. Housekeeping is provided daily.